In a large bowl, combine most of the flour, almond flour, a quarter of the sugar, and salt. Add the cold butter and rub it into the flour mixture with your fingertips until it resembles a coarse meal. Add cold water and mix with hands, lightly kneading the dough in the bowl until it forms a ball. Flatten the ball into a square and wrap in plastic. Chill in the refrigerator for approx. 1 hr. Scrape vanilla bean. In a small bowl, add the mascarpone, honey, vanilla bean seeds, and cardamom, and whisk until smooth. Set aside. Trim ends of rhubarb and cut into large matchsticks. In a medium bowl, combine the rhubarb, remaining sugar, and remaining flour. Set aside. Preheat oven to 200°C/400°F. Remove the dough from the refrigerator and let it sit for approx. 5 min. at room temperature. On a lightly floured work surface, roll out dough to a 30-cm/12-in square. Carefully transfer the dough to a baking sheet lined with parchment paper. Spread mascarpone filling over the dough in an even layer, leaving a border around the edges. 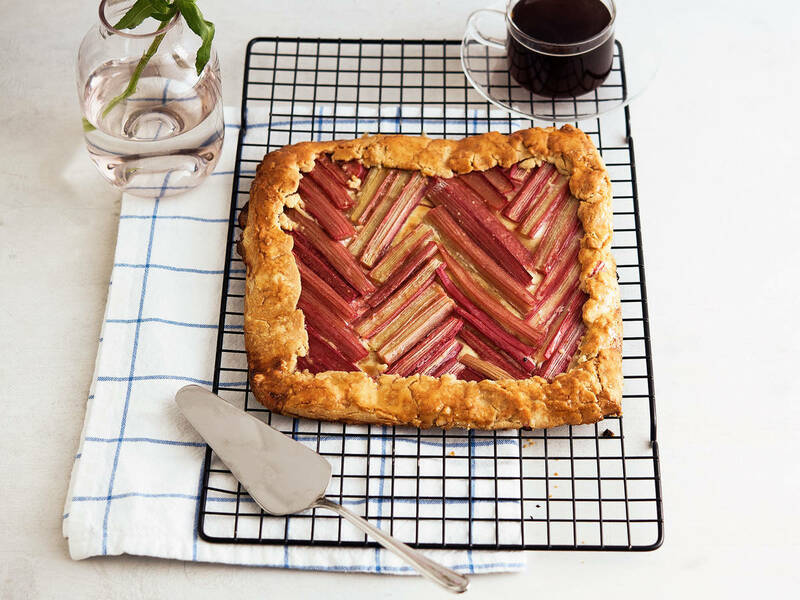 Arrange the rhubarb in a chevron pattern over the mascarpone cheese filling; cut the rhubarb as necessary to fit. Fold the edges of the dough over the rhubarb and crimp. Beat egg yolk into a bowl and brush the dough with it. Sprinkle with sugar and bake at 200°C/400°F until the crust is golden brown, approx. 40 - 45 min. Heat honey in a pot until warm. Brush over rhubarb and serve immediately, or at room temperature. Enjoy!